The Israeli wall in the West Bank gained final approval ten years ago on 16 June 2002 and construction began a few days later. The route for the planned 490-mile barrier was drawn without any agreement with the Palestinian Authority about where the official border was or should be. Over 80% is constructed beyond the pre-1967 armistice line, known as the Green Line, which marks the familiar edges of the West Bank on a map. By 2007 Israel had finished over two-thirds of the planned barrier, but the pace of construction has since slowed. Although it is incomplete, the wall’s cost of over $1 billion still makes it the most expensive and largest Israeli government construction project in the past decade, and its seeming permanence confers a political reality that should have been negotiated. Originally, the Israeli government justified the wall in the very narrow sense as a temporary barrier against terrorist attacks. An Israeli Ministry of Defense website currently states “The sole purpose of the Security Fence … is to provide security. The Security Fence is a central component in Israel’s response to the horrific wave of terrorism emanating from the West Bank, resulting in suicide bombers who enter into Israel with the sole intention of killing innocent people.” The UN charter recognizes the right of every member state to defend itself and its citizens from attack. Under that standard, the sections of the barrier built on the Israeli side of the Green Line are legal. 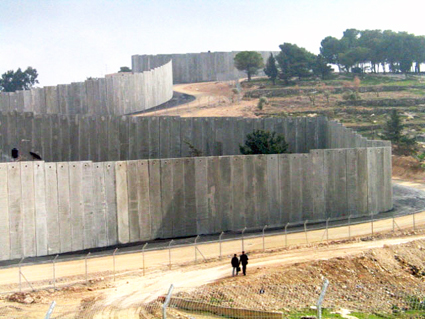 Critics contend that most of the wall is built on occupied territory. In 2003, the UN General Assembly voted 144 – 4 to condemn the barrier (the US vetoed the Security Council resolution). A 2004 International Court of Justice advisory opinion called the wall “contrary to international law” and said the sections in the West Bank should be removed and reparations paid to those whose land was confiscated or whose property was destroyed to build it. The Israeli government dismisses these arguments and asserts instead that the West Bank is historically Jewish land and is not occupied territory because it was never previously an independent, recognized sovereign state. Palestine was part of the Ottoman Empire from the 1500s through the end of World War I, and then a British protectorate from 1920 until World War II. After the creation of Israel in 1949, the West Bank was administered by Jordan until the Israeli military occupied it during the Six-Day War in 1967. Today the Israeli argument that Palestine is not a sovereign state territory is increasingly undermined by the sheer number of countries around the world that formally recognize a Palestinian state within the pre-1967 borders. Although the US, with its Security Council veto power, remains opposed to formal recognition at the UN, fully two thirds (126/193) of the UN member states already formally recognize a Palestinian state. Despite the official Israeli position that the wall is a temporary barrier against terrorism, its political consequences cannot be ignored. The wall extends around several large Israeli settlements in the West Bank and situates them firmly on the Israeli side. The wall encloses important aquifers and cuts Palestinian farmers off from their fields. Arguably the most significant consequence is that the wall physically separates Jerusalem and its important religious sites from the rest of the West Bank. Not only does it place both West and East Jerusalem on the Israeli side, but it also goes deep into the West Bank in order to include new Israeli settlements, which effectively creates a buffer around the city. In January 2012, Palestinian officials reported that in closed door talks Israeli negotiators abandoned the position that the wall was temporary and proposed the wall route itself as the final political border between Israel and a new Palestinian state. In late May, Israeli Defense Secretary Ehud Barak stated publicly that Israel should consider unilaterally establishing a border between the two states. If the wall does become the final border, it will substantially expand the territory of Israel at the expense of longstanding Palestinian property rights and religious connections to the land. It will also demonstrate the power of walls to crystallize and formalize claims to territory by physically excluding other people from the land. Finally, it will undermine the international consensus against the annexation of territory gained through expansionary wars. Rather than setting this dangerous precedent, ten years after construction began the United States and the international community should reaffirm that the Green Line, rather than the route of the wall, as the starting point for any future talks about a border between Israel and Palestine. The territorial conflict should be resolved through a negotiation that respects the rights and concerns of both Israelis and Palestinians, not through the unilateral construction of a separation wall. * Reece Jones is an Assistant Professor of Geography at the University of Hawaii at Manoa and the author of «Border Walls: Security and the War on Terror in the United States, India, and Israel». He is a member of the American Geographical Society’s Writers Circle.